Australian Abalone Fisheries typically target spatially structured stocks, often in remote areas. The nature of these fishing operations means precise recording of fishery-dependent data is challenging, and fishery independent data collection to determine stock status is cost prohibitive. An electronic data collection system has been developed at the University of Tasmania, using passive GPS and depth/time data loggers to collect high-resolution, high-quality spatial location and effort data from abalone divers. The geo-referenced diver data are used to calculate a range of spatial performance measures for assessing the performance of the fishery at an appropriate spatial scale. Central to the development of these spatial performance measures are analytical methods widely used in animal movement research – kernel density functions and path classification – to determine home range and animal movement behaviour. 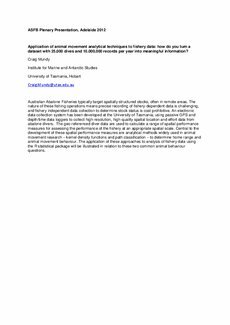 The application of these approaches to analysis of fishery data using the R statistical package will be illustrated in relation to these two common animal behaviour questions.